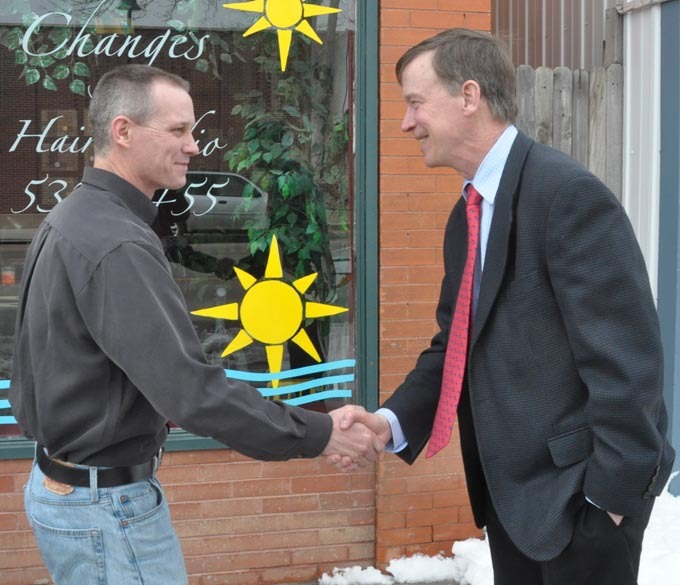 Denver mayor and Democratic Party gubernatorial candidate John Hickenlooper, was in Berthoud on Friday morning. 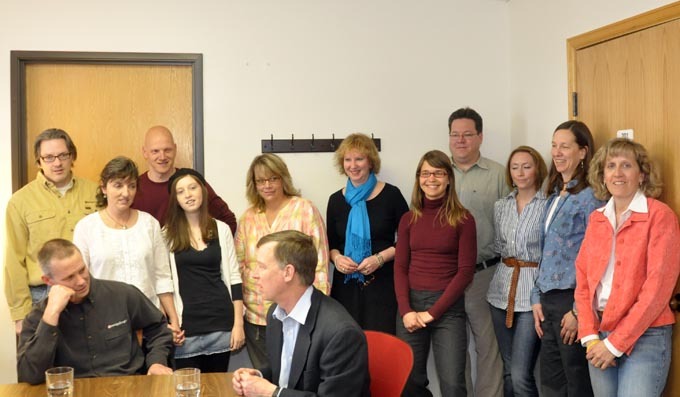 Hickenlooper and his campaign staff came to visit EnergyLogic, a thriving Berthoud business. He said that EnergyLogic first came to his attention when it was selected as an Energy Star Partner of the Year by the Environmental Protection Agency. The Energy Star award cites EnergyLogic for providing rating service to 49 Energy Star builders and directly verifying approximately 20 percent of all homes built in Colorado in 2009 and for its training programs for its rating partners. Hickenlooper said that EnergyLogic was chosen from over 17,000 candidates and these unsung heroes are people he wants to see. EnergyLogic principal Steve Byers greeted Hickenlooper on the sidewalk outside the offices and escorted him upstairs for a tour of their new facilities. Beyers explained that the business had outgrown it previous location, a house on the east side of Berthoud that was still used the training facility. Following a tour of the office, Hickenlooper sat down with Byers to discuss ways to have more homes become energy efficient. Citing the savings for consumers and the reduction in greenhouse gasses, Hickenlooper thought it was an important action to take. While he was not fully convinced that the effects of global warming would be as dire as some predictions, he also felt that we should not stand idly by in case those predictions are correct. One of the avenues he suggested was applying the energy conservation measures to existing homes as they are put on the market. He said he had convinced realtors in his area that it was feasible if the process could be done in a short time, so as not to delay a sale. Byers told hem that was entirely possible, that his company could rate and upgrade a house in two weeks. The problem, they both agreed, was that appraisers do not factor those improvements into their assessment and mortgage brokers are reluctant to include them. Byers used his home as an example. The solar panels he installed produce enough electricity that at times the meter turns backwards, yet, on an appraisal, that adds nothing to the property value. Hickenlooper said that they needed to form a partnership to lobby for a change in the appraisal format. He emphasized that non-partisanship and cooperation were the avenue to get things accomplished. He pointed out that when he took office in Denver, that the metro area communities were at odds with each other. “Now we have an non-poaching agreement where we do not offer incentives to lure business from one community to another,” he said. He felt the cooperative atmosphere was beneficial to all. Byers explained the importance of qualified energy raters, saying that someone poorly trained could create a dangerous situation and put a homeowner at risk. His company’s program is an intensive six-day course, after which he tells the graduates that they now know just enough to be dangerous. The quality of the company’s training program was cited in the company’s Energy Star Award. Byers invited the group to visit the training facility where they could observe a demonstration of some of the techniques used in rating a home’s energy efficiency. At the training facility, Byers showed a cut-a-way furnace and a water heater that are used as training devices in the classes. The staff also erected a blower door to create a slight vacuum in the house to enable the identification of air infiltration. The demonstration finished up on a high tech note as Byers showed the mayor an infrared (IR) thermal imager, used to show visually the temperature differences in a room. The Mayor and his party left shortly before noon, getting back on the campaign trail. Hickenlooper will face stiff opposition when the campaign begins in earnest. Earlier this year, before he announced his intentions, the Denver Post editorialized about Hickenlooper saying, “Even though he governs a left-leaning city, Hickenlooper has been a pro-business Democrat who has even earned many Republican fans. And he’s been an effective problem-solver …” If he takes the time to visit Berthoud, it indicates he is taking even the smaller communities seriously. EnergyLogic principal Steve Byers greets Denver Mayor John Hickenlooper outside the company headquarters.